We hope you enjoy our web site and would appreciate your comments. If you experience any difficulties, please contact our Web Master. 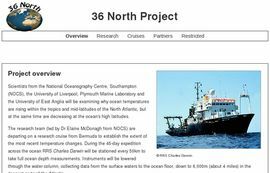 The 36 North project aims to investigate and understand the influences on global climate regulation, with a focus on the current role of the North Atlantic subtropical gyre. 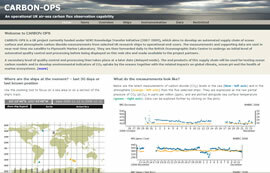 CARBON-OPS aims to develop an automated supply chain of ocean surface and atmospheric carbon dioxide measurements from selected UK research ships to operational end-users. 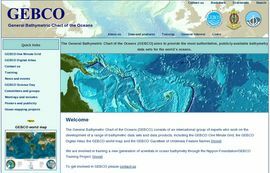 GEBCO aims to provide the most authoritative, publicly-available bathymetry data sets for the world’s oceans. It consists of an international group of experts who work on the development of a range of bathymetric data sets and data products, including gridded bathymetric data sets, the GEBCO Digital Atlas, the GEBCO world map and the GEBCO Gazetteer of Undersea Feature Names. 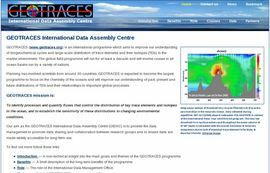 GEOTRACES is an international programme which aims to improve our understanding of biogeochemical cycles and large-scale distribution of trace elements and their isotopes in the marine environment. The global field programme will run for at least a decade and will involve cruises in all ocean basins run by a variety of nations. 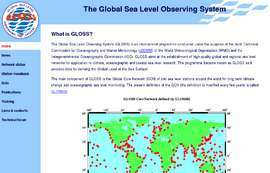 GLOSS is an international programme conducted under the auspices of the Joint Technical Commission for Oceanography and Marine Meteorology (JCOMM) of the World Meteorological Organisation (WMO) and the Intergovernmental Oceanographic Commission (IOC). 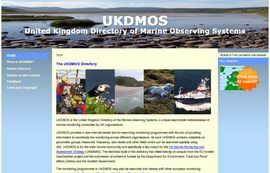 There is a basic requirement to know where, when and what is being monitored by the UK in the marine environment. This information on monitoring programmes was not previously held or accessible from a central point. UKDMOS was built to overcome these difficulties. 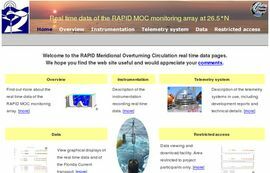 RAPID MOC (a component of the Rapid Climate Change (RAPID) programme), is part of a monitoring array to measure the Atlantic Meridional Overturning Circulation (MOC). The web site displays real time data (when available) received from two key moorings of the array along with data received from a second telemetry system designed and deployed by researchers at the University of Miami’s Rosenstiel School of Marine and Atmospheric Science (RSMAS). 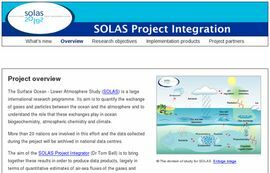 SOLAS is a large international research programme that aims to quantify the exchange of gases and particles between the ocean and the atmosphere and to understand the role that these exchanges play in ocean biogeochemistry, atmospheric chemistry and climate. MEDIN is an open partnership working to deliver improved access to and stewardship of UK marine data and information. Partners represent government departments, research institutions and private value adding companies. The network has created a framework of accredited data archive centres (DACs); provides guidance on metadata and data standards and maintains a suite of data products and services. BODC is an accredited DAC with specific responsibility to archive water column oceanographic data. We also host the MEDIN core team.